Welcome to KERN's translation office in Ulm! With only 120,000 inhabitants, the university city of Ulm may be one of Germany's smaller major cities, but it is rich with history. Ulm lies on the Danube and became a cultural and economic centre of Europe towards the end of the 15th century. Ulm Minster is well known for having the tallest church steeple in the world, and the most famous mathematician in the world, Albert Einstein, was born in the city on the Bavarian border. KERN opened its branch here in 2007. Since then, our branch has assisted numerous customers from the region with varied language service requirements. If you would like to visit us in person, we are located in Ulm's charming city centre around 400 metres on foot from the main railway station. Come and stop by – we are looking forward to your visit! Leave the main railway station via the main exit and go through the underpass. You are now in the pedestrian zone. Continue along the pedestrian zone (initially in Bahnhofstraße, which then becomes Hirschstraße) and keep walking towards Ulm Minster. 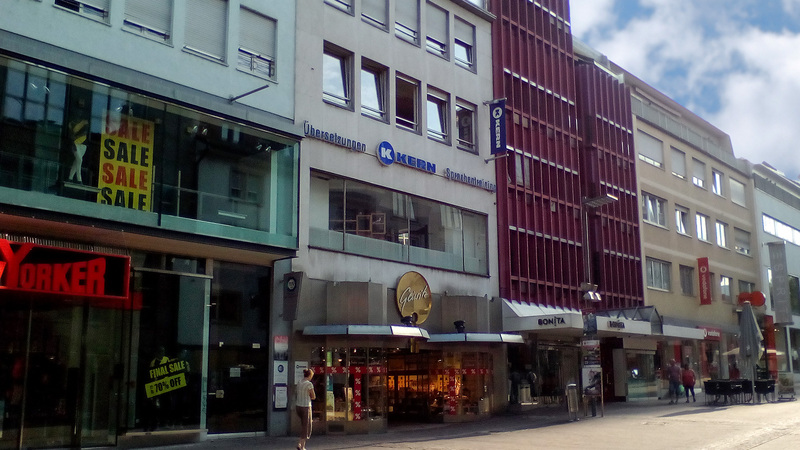 In about 350 metres, you will see the Geiwitz shoe shop on your left-hand side. We are located in the same building on the first floor. Take the exit marked "Ulm-West" and head into Ulm (B10, via Hindenburgring and Bismarckring). Turn left onto Zinglerstraße behind the Ehinger Tor and then follow the signs in the direction of the Innenstadt/city centre (via Zinglerstraße and Friedrich-Ebert-Straße) over the railway. You will now see the Deutschhaus car park on the right-hand side of the street. Drive until you reach the exit marked "Ulm-West" and follow the instructions above. At the Ulm/Elchingen junction, change onto the A8 towards Stuttgart and take the exit marked "Ulm-West". Then follow the directions above. Leave the A7 at the Neu-Ulm/Hittistetten motorway junction and head towards Ulm/Stuttgart (B28, Adenauerbrücke). Turn right after the Donaubrücke (bridge over the Danube) and then follow the signs in the direction of the Innenstadt/city centre (via Zinglerstraße and Friedrich-Ebert-Straße) over the railway. You will now see the Deutschhaus car park on the right-hand side of the street. Leave the car park through the exit by Galeria Kaufhof. In around 50 metres, turn right onto Bahnhofstraße (which then becomes Hirschstraße) and keep walking towards Ulm Minster. In about 200 metres, you will see the Geiwitz shoe shop on your left-hand side. We are located in the same building on the first floor. You can also park in the Am Rathaus and Sedelhof car parks.